I recently picked up a pi2jamma, which is a JAMMA compatible arcade board made to interface with a Raspberry PI 3. This is in use as an alternate JAMMA board in my Neo Geo Arcade Cabinet. The other comparable device to this is the RaspberryJAMMA / Arpicade. This uses the HDMI video output and converts to VGA. The pi2jamma was created by Jochen Zurborg. 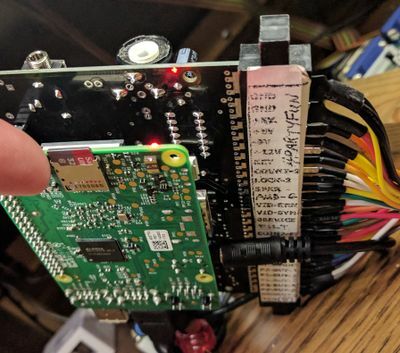 Its design is fairly simple, you simply mount the Pi3 on its GPIO pins and connect the audio from the headaphone jack out of the Pi in to the pi2jamma. 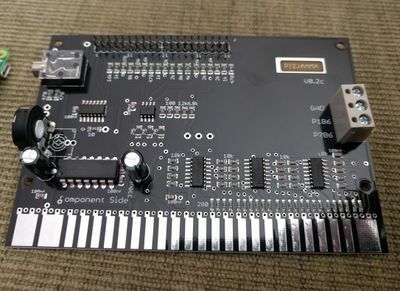 Power is provided over GPIO, no additional connections are required outside of your JAMMA harness. Integrated VGA 666 adapter circuitry which uses GPIO pins 4 - 21 and requires at least a Pi3. 3 74LS165 shift registers to allow for a total of 24 inputs over the few remaining GPIO pins (todo: which GPIO pins exactly?). This method is used because there are very few remaining GPIO pins to use. Other JAMMA/Pi solutions that use the pi's build in HDMI port tend to use mk_arcade_joystick_pi. Regamebox is the official software distribution. Work has been done to make Retropie work as well. I have been working on porting the Arpicade software (intended for RaspberryJAMMA) which is just changing a few modules and script settings. Disable the mk_arcade_controls GPIO driver by commenting out the contents of /etc/modprobe.d/mk_arcade_joystick.conf. The pi will not boot with this and the vga666 drivers loading. At this point you should have a pi that boots and displays video, see if that is indeed the case. If so, Let's do the remaining steps via SSH. Default auth is the same as Raspbian - username: pi, password raspberry. You could su to root and set its password too, I did so and set it as arpicade. All of the remaining steps require you to be root or use sudo. At this point you should have a functional Arpicade image on pi2jamma. Note that all of these things should work equally on a fresh Raspbian install as well, you'll just have to do extra work to get a frontend to work. Arpicade uses the Attract Mode frontend by default. This page was last edited on 27 January 2018, at 12:27.